Headdresses of northern and central provinces of Russia: kokoshniks, bandages, “povoyniks”, sudariums were of special luxuriousness. They were embroidered by golden threads, strasses, river pearls and cut mother-of-pearls. The most decorated kokoshnik was put on a bride in the wedding ritual. Therefore maidens prayed about their marriage on Pokrov holiday. Thick “podnizi” “in refid” covering the forehead to the eyebrows were sewn to the kokoshnik. 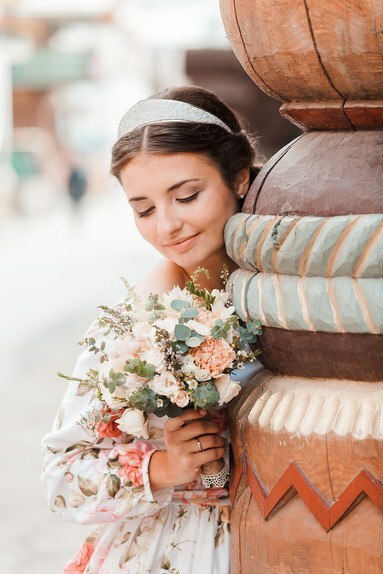 Captivating image of the Russian beauty was finished with pearl necklaces, frocks, pendants, and thinnest earrings in the shape of butterflies, berries and flowers. Ufa based jewelry designer Katerina (brand BREBEND (livemaster.ru/kbrebend), has founded her brand more than three years ago. According to Katerina, there is a very strong demand for Russian style jewelry. The "brand’s trademark- the stylized kokoshnik which never go out of style. 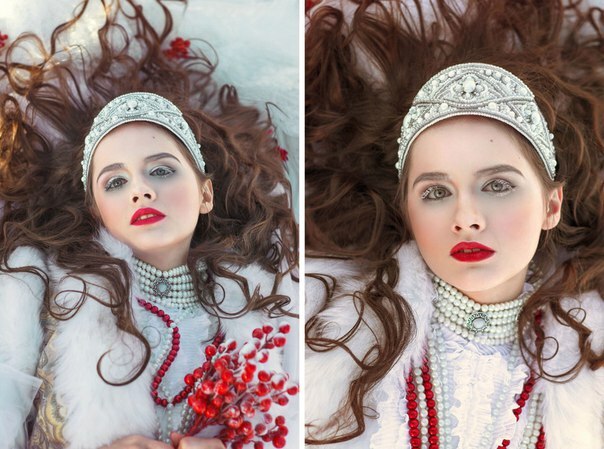 Russian designer, Katerina Brebend’s gorgeous collection of Kokoshnik style headdress and tiaras have become a must have fashion accessory for brides. Her creations are often featured alongside their designs in magazine photoshoots and on the catwalk. She grew up in an artist family and received a proper education. Love to do something with her own hands has been since childhood. When it was time of well-deserved maternity rest, she automatically reached for handiwork. Night after night, like spellbound, she tried different techniques, while her son slept. First, she made jewelry from polymer clay, but when her hands touched the metal, she fell in love with it and creativity poured like a song. “I never seeked for inspiration on the Internet, looking through numerous workshops. It was much more interesting to find my own solution to the problem. I didn' t do anything supernatural, of course. Just combined different techniques and materials Personal style comes from the heart. It's hard to say what it's made up. Sometimes I wonder what gave me the idea to do something so. I do not have time to figure out where I dreamed up the idea of that. A great inspiration I receive from antique jewelry and works of ancient jewelers. At the moment, I work mainly with metal: copper, brass and steel. I try to develop new tools and equipment. One of the favorite techniques is Wire Wrap. There's lots of possibility in working with copper wire. I chose a vintage style – that’s why my decorations have a special charm and romance of the ancient appearance. Sometimes I’m asked what the museum these works are from?” - I am very touched. Now it is my main income. Together with my husband I visit the design-markets in different regions. Our geography is small: Ekaterinburg, Samara and Kazan. But we plan to expand horizons. Travel and work are beautifully aligned. Geography of online sales are much wider: from New Zealand to Canada. Hand-made is now very widespread, probably because of the availability of various resources and master classes online. And at the same time this concept vulgarized and reduced to a very low level of the product. It is believed that everybody may try their hands at making accessories and become jeweler, looking masterclass. It's a little frustrating. It is very rare to find really interesting master, who has his own handwriting. How to choose kokoshnik and what modern kokoshnik should be? Katerina’s brand tries to make such forms and types of kokoshnik, which could be worn in the city. The most "urban" decorations can be the ones that can be easily put on and take off, but at the same time - comfortable to wear. Wreaths, which are worn by the nape of the neck, low kokoshniks, barrettes, hairpins and tiaras made of light brass. According to Katerina, this kind of hair decorations are often bought by girls for various celebrations: weddings, holidays, graduation and other. For such special occasions (holiday clothes) sophisticated jewelry with regard to the type of hair is more appropriate. Girls with long hair, for example, often chose decoration for "Greek" hairstyle. Regardless of the circumstances under which she will wear a kokoshnik, the main "secret of success" - a matching jewelry with anatomical features of the future owner. It is important to consider the size and wishes - how a girl is planning to wear kokoshnik, what angle and what hairdo. If it is done correctly, in a I will receive such reviews from customers: "a diadem is weightless, forgot what it is on my head" "no pressure, not too tight behind the ears, and does not fall down," "does not snag my hair, holding the strands." All this is extremely important! Headbands-crown and stylized kokoshnik Very comfortable lightweight rims in Russian style - small neat kokoshniks, which are made of brass. Despite the fact that they are made of metal, they do not put pressure at the ears. Kokoshnik will suit both long hair and short-hair. According to feedback from shoppers, this accessory is very different applications. Some use it to create a real image of the Russian - for example worn on the street, combining with Pavlovo Posad handkerchief and with a braid. Others, on the contrary, "see" in it an element of Western European style, and wear an elegant dress or pantsuit. Kokoshnik can be worn on the head as the hoop, pushing him on the forehead or on the back of the head, but you can also flip it and put on your neck to get a high standing necklace. The texture of stylized kokoshnik - simple and discreet, and buyers say, "it provides the comfort, novelty, non-obviousness and utility so it is quite possible to wear kokoshnik as an accessory with everyday clothes." Stylized rims, crowns and kokoshniks.